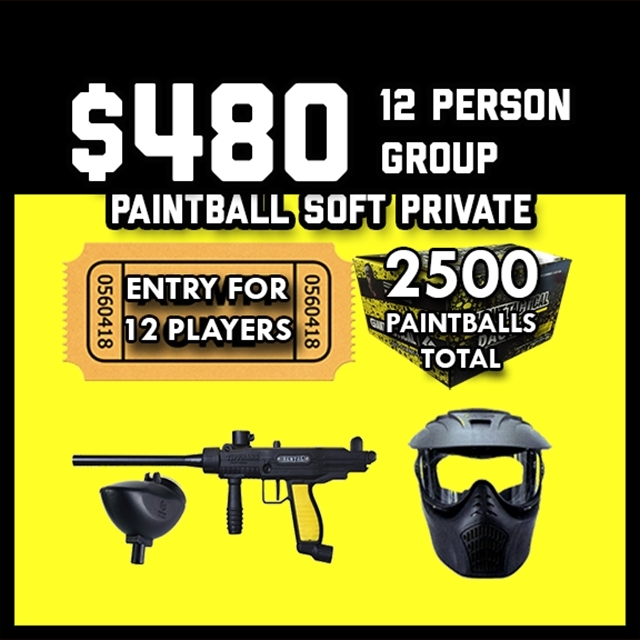 $480.00 for 12 players, players gets: Entry, Gun Rental, Mask Rental and All Day Air. And in addition 2500 paintballs to share to get started with (.50 Caliber Play). Available on normal operation hours only. Group Duration: 3 Hour Group (First hour for group check in and set up and 2 hours play time) ADDITIONAL INFORMATION: Field Paintballs Only. No Outside Paintballs Allowed. Players must be at least 10 years old to play. Private group time starts on your scheduled time and ends exactly after three (3) hours. Any extensions for any reason such as arriving late will be $100.00 per hour. Package does not guarantee that the number of paintballs will be enough for the duration of the group. Additional paintballs will be needed and must be purchased at the park. If number of players is under the required minimum, group must pay the minimum number of players due to the package being a bundle. Additional players will be $35.00 per person and will get the entry, gun rental, mask rental and all day air (paintballs are additional). Advance reservation and deposit required. Cancellations must be made 72 hours in advance for a full refund. Otherwise group can be rescheduled to a different day as long as park is notified 24 hours in advance. Group has 3 times to reschedule in a 6 month period otherwise, deposit will be forfeited. No shows will result to forfeiture of all deposit paid.